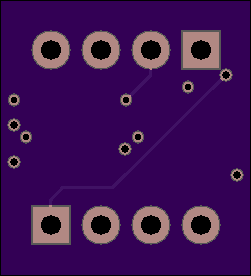 4 layer board of 0.50 x 0.55 inches (12.7 x 14.0 mm). Uploaded: April 1st, 2018 17:07. This was an April Fool's joke… but I don't think anyone got it. This was an April Fool’s joke… but I don’t think anyone got it. 2 layer board of 1.48 x 0.90 inches (37.5 x 22.9 mm). Uploaded: December 24th, 2017 20:57. 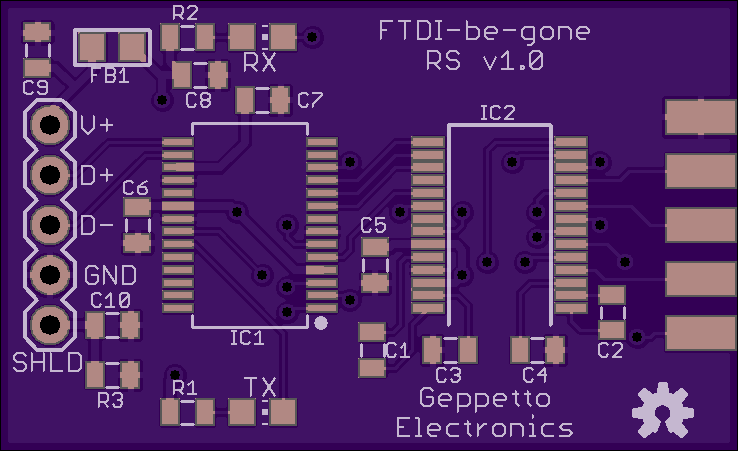 This is a version of my FTDI-be-gone RS-232 board, but with SSOP instead of QFN parts, and designed to be directly wired to a USB cable. Connect the signal/power ground pin of the USB cable to the GND pin and connect the cable’s shield to the SHLD pin of the USB connector (there is an RC circuit between the two designed to break ground loops but shunt AC to ground). 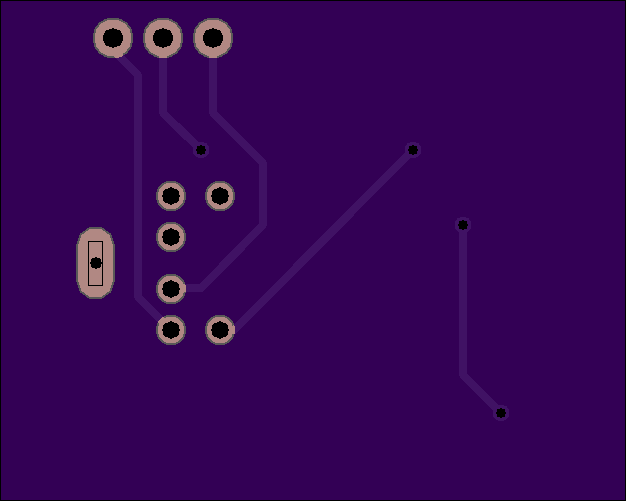 Mount a PC pin DB9M on the edge of the board for the RS-232 connection. NOTE: Both ICs have pin 1 oriented towards the bottom of the board. Uploaded: December 24th, 2017 05:30. This board adapts the GPSDO diagnostic port to RS-232. 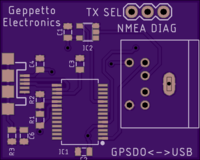 You get to select whether to transmit the diagnostic output or the GPS NMEA output. PPS is sent to DCD, and is positive-oriented (that is, DCD asserts on-time). 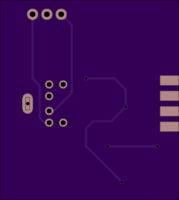 The SOIC-16 chip is a MAX232. The SOT23-5 is a single inverter. All 6 caps are 0.1 µF. The edge-mounted DB9 should be a female. It can connect directly to a DB9M style serial port or cable. The diagnostic connector is a CUI MD60S. 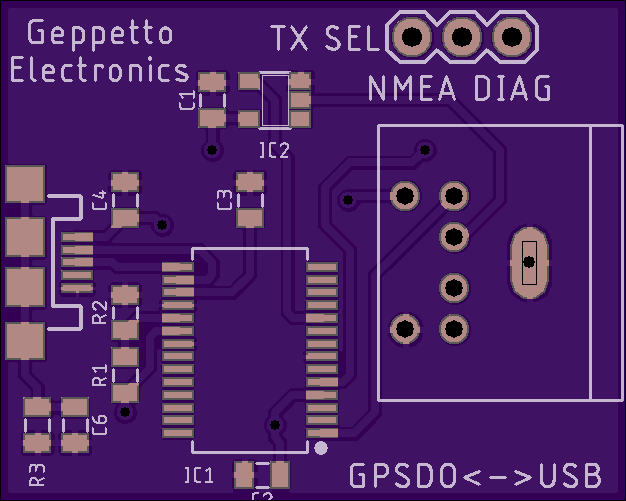 You use a straight-through mini-DIN-6 cable (like a PS/2 cable) to connect up to the GPSDO. 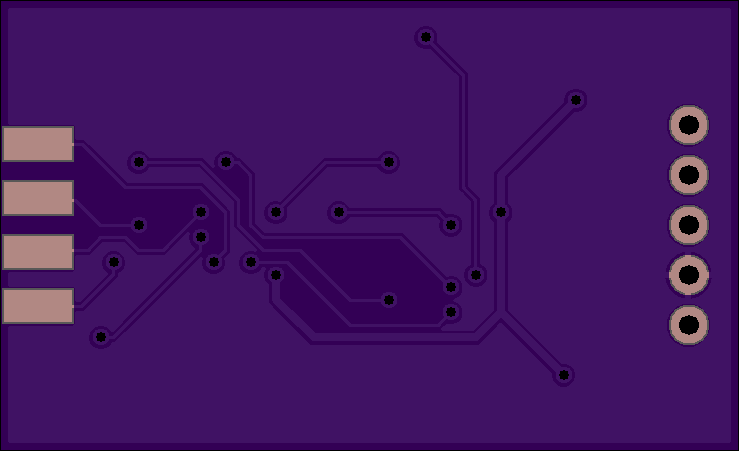 For maximum stability, you should keep this board connected permanently if you’re going to use it. 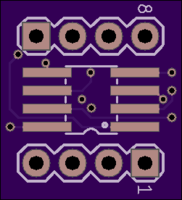 Adding and removing powered loads on the diagnostic connector can have a short term stability impact. 2 layer board of 1.25 x 1.00 inches (31.8 x 25.4 mm). Uploaded: December 24th, 2017 05:29. 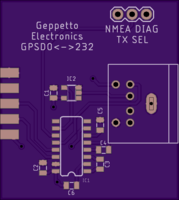 This board adapts the GPSDO diagnostic port to USB. You get to select whether to transmit the diagnostic output or the GPS NMEA output. PPS is sent to DCD, and is positive-oriented (that is, DCD asserts on-time). The USB interface is a CDC device. Open it and set it for 9600 baud 8N1. Uploaded: November 29th, 2017 21:50. This board doesn't work. It shorts out the power supply of the GPSDO. Don't use it. This board doesn’t work. 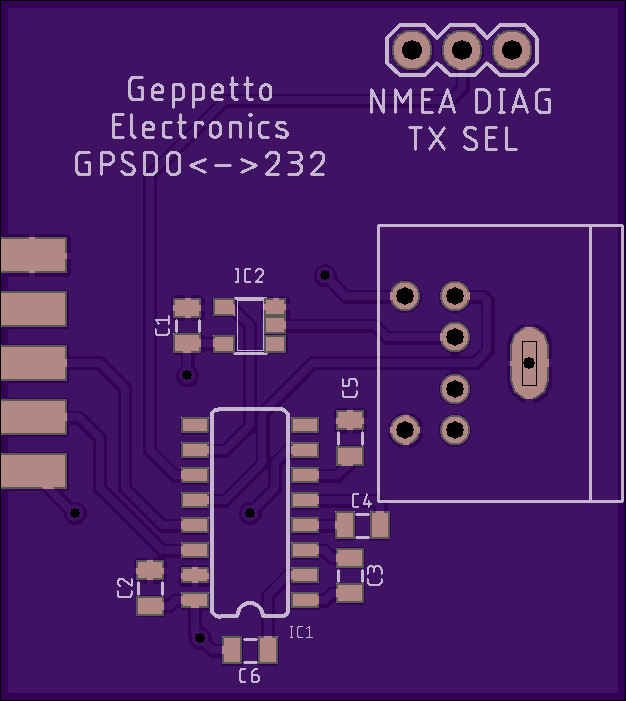 It shorts out the power supply of the GPSDO. Don’t use it.